C. elegans nematodes, or roundworms, undergo examination by project scientists. The worms are descendants of those that were part of an experiment that flew on the shuttle Columbia's last mission, STS-107, in 2003. The new worms were flown to the International Space Station on the shuttle Endeavour during the STS-134 mission in May 2011. When the Columbia space shuttle disintegrated upon re-entry to the Earth's atmosphere, killing all seven astronauts on board, NASA scientists expected that the 80 science experiments aboard the shuttle were destroyed as well. But in the days after the tragic Columbia shuttle disaster on Feb. 1, 2003, scientists began realizing that wasn't the case. 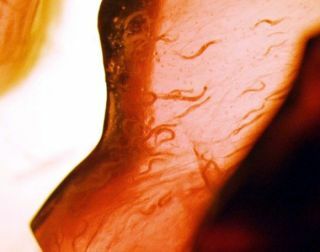 Various salvageable experiments were recovered from the wreckage, including a live group of 1 millimeter-long roundworms, or nematodes, known as Caenorhabditis elegans. No one expected that the nematodes could survive the intense heat of re-entry, but the C. elegans got lucky, said Nathaniel Szewczyk, a scientist who worked with the nematodes in the aftermath of the crash. "They sustained some heat damage to exteriors, but that's about it," Szewczyk said. The thermos-size metal container holding the nematodes was housed inside the locker of a crew compartment that was reinforced specifically to protect the materials inside. Once that compartment ruptured, however, the nematodes still survived the crash to Earth thanks to the locker's build, Szewczyk said. It took some time for the experiments to be released into the hands of the researchers. All materials from the shuttle were kept under tight watch as the investigation into the cause of the crash was still ongoing, Szewczyk said. Most of the experiments on board the shuttle involved observing how certain genes were expressed differently when in space versus on the surface of the Earth. Because researchers didn't have access to the worms immediately after the crash, most of the results from those experiments were lost. However, important science still came from the tragedy, Szewczyk said. "From an astrobiology standpoint, the important thing was that if you had a multicellular organism going through the atmosphere you can have interplanetary transfer of life by natural means, and Columbia demonstrated that," Szewczyk said. "It was a fortunate thing to demonstrate that in the unfortunate circumstances that there were." After Columbia, populations of C. elegans were sent up for experiments on the space shuttle Atlantis and the International Space Station that have helped researchers get a more detailed picture of what life in microgravity can do to an organism. Some of the work done on these nematodes even relates directly to how humans experience space travel. Like astronauts losing muscle mass, while in space, the nematodes show signs of muscle loss. Nematodes as well as humans also appear to have some diabetic symptoms while living in zero-gravity. The shuttle's STS-107 astronaut crew, which included commander Rick Husband, pilot Willie McCool, and mission specialists Michael Anderson, Laurel Clark, Kalpana Chawla, David Brown and Ilan Ramon, worked in two shifts to perform a host of science experiments inside Columbia's SpaceHab module. The shuttle, meanwhile, remained in its own orbit and did not visit the International Space Station. Once space shuttle missions resumed in 2005, every flight was destined for the space station in order to complete construction of the orbiting laboratory. NASA's space shuttle fleet retired in July 2011 after the final flight of the shuttle Atlantis during the STS-135 mission. The offspring of the Columbia nematodes are now housed in the Caenorhabditis elegans Genetic Center run by the University of Minnesota. Some of those Columbia roundworm descendants were launched into space in May 2011 during NASA's final flight of the shuttle Endeavour before that orbiter was retired.